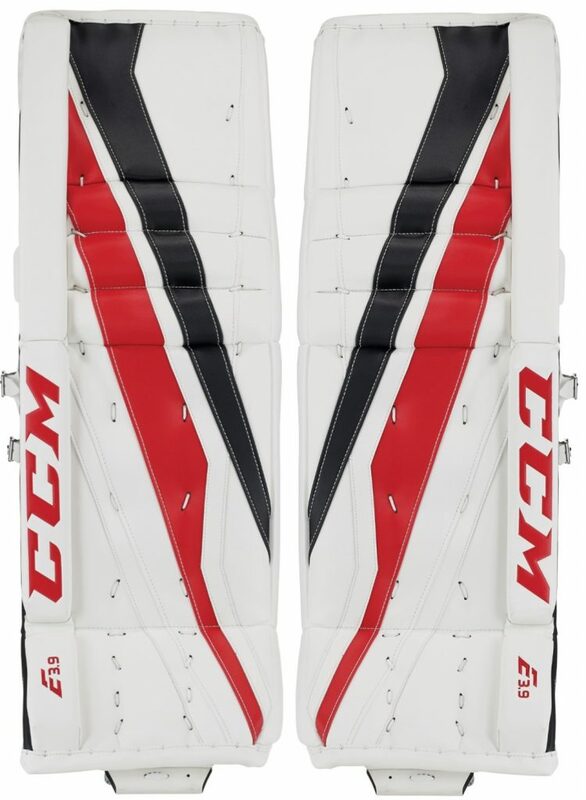 CCM E-Flex E3.9 Senior Goalie Leg Pads | Sports Etc. Designed and created for quick gliding and explosive cross-crease power pushes. The outer flex of the pad is a single break, allowing for maximum flexibility. The pad’s inner flex is pre-curved with a single-break core. Close that 5-hole with ease! The Extreme Flex E3.9 leg pad’s boot flex is 90 degrees with torsional flex. The deep, ultra soft boot channel allows for more freedom of movement. Featuring a tight fit one-calf strap, the Extreme Flex E3.9 leg channel/calf strap option is lightweight with a closer feel to the leg for better control. Customize your fit at or below the knee with a single adjustable knee strap system. Deeper than its predecessor, the removable knee cradle wrap with recessed foam plays a big role in closing your 5-hole. The new lightweight, thin-molded foam core offers exceptional weight balance for a quicker transition into butterfly. PE foam helps seal the pad to the ice. Keep your thigh and knee safe and comfortable. React quickly with the new Extreme Flex E3.9 goalie pads. New Speed Skin Technology helps to provide quick gliding and explosive power pushes for maximum speed in the net. Sports Etc Performance To Value Rating– 9 out of 10. The traditional knee roll design provides a flexible pad, which is great for any butterfly goalie that is looking for an enhanced “feel” of the puck.